Original location on Grand Ave, next to Ramsey Jr. High. 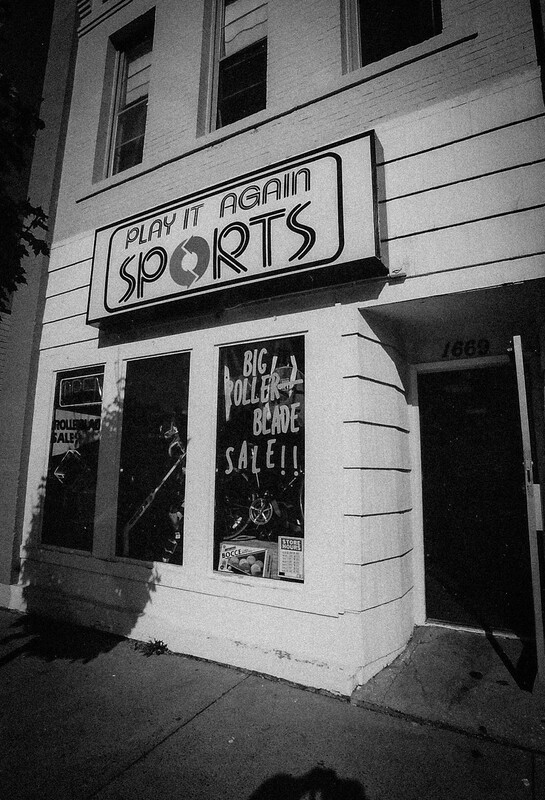 Play It Again Sports, St. Paul is one of the original Play It Again Sports. The store has been locally owned and operated since 1983. In the mid 90s it moved from its original location on Grand Ave to Cleveland Ave. In 2005, the store moved to its current location on Snelling Ave.
We offer a wide range of new and used gear. Can't quite afford that new pair of hockey skates? Trade your old pair in for a discount. Your kid is growing like a weed? Find used equipment for them and trade it back in when they need the next size. The Play It Again model offers an affordable, efficient, and environmentally friendly way to get your game on. We're actually, positively, legitimately locally-owned! Since January of 2015, Play It Again Sports--St. Paul is owned my brother, myself and one of my best buds. We're all under 30. We grew up within two miles of the store's current location. We attended St. Paul Central. We played baseball at Highland Little League and could regularly be found bumming around local parks and rec centers--shooting hoops, playing boot hockey, etc. The store remains eternally short-staffed Saturday mornings for our weekly football games. Basically, we're just grown-up kids from the neighborhood, not business men. And I hope that is somehow positively reflected in the store itself. I've been working here since I was a junior in High School and before that I worked at M&L Sports, rest in peace. Combined, the three of us have over twenty years of sporting goods experience. Obviously we want the store to be financially successful but we also want the business to have a positive impact on our community. One way we strive to do this is by creating partnerships with local schools, organizations and associations. We're always looking to expand these partnerships so if you're in a administrative position with a sports-related organization and think we'd make a good team, please email us! In addition to having a positive impact on the community, we'd also like to have a positive impact on the environment. There are certain positive environmental reverbarations to operating a second hand sports store (each used item sold replaces tons of steps along a supply chain, including manufacturing, packaging, and shipping) but we're aiming to compound these with global initiatives as well. For example, this holiday season, we're donating a tree to Ethiopia for every $100 purchase through the Eden Reforestation Project. We've also been donating equipment to orphanages in third-world countries. But in the end, what we really want is to provide St. Paul with a cool, locally owned and operated sporting goods store. Let us know the ways we can improve your shopping experience.